Forty-four years ago, December 7, 1869, the Gallatin bank was robbed. It is said by the James boys and Jim Anderson. It was a dark, gloomy day. The cashier of the bank, Capt. 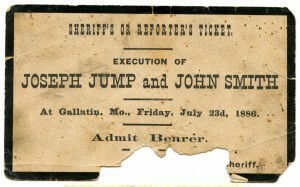 John Sheets, was killed. The robbers got about $100 and left a fine bay mare that was worth more than the money they took from the bank. The mare was taken by Daniel Smoot, who was forced to give up the horse he was riding to his home southwest of Gallatin. The robbers told him he could have the mare left in town. This mare was kept for several years by Mr. Smoot and he raised several fine colts from her. The bank building stood at the southwest corner of the square, the present site of the Mann & Musselman Hardware Store. 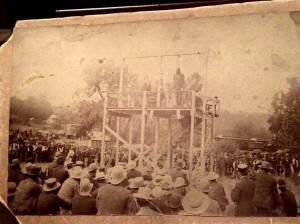 The picture, shown here, was taken in 1903, a short time before the authentic bank building was torn down. The marks of one of the bullets made during the robbery was pointed out to school children on their way to school and to inquiring strangers up to the time the building was torn down. In October, 1876, Governor Woodson of the state offered a reward of $1,000 for the James brothers and under date of Dec. 20, 1878, Jesse James replied from Deer Lodge, Montana Territory, denying the robbery by saying they were not in the state at the time of the bank robbery. He said among other things that if he was offered a fair trial that they would come to any place in Missouri except Gallatin, if the governor would guarantee them a fair trial, and would agree not to honor extradition papers from the governor of Iowa. Nothing came of the offer. Jesse James was killed by Bob Ford in St. Joseph, MO, in April, 1882, and Frank now lives on his farm near Kearney, MO, and he is about 70 years old. Mrs. Sheets, the wife of the bank cashier killed, offered a reward of $500. Daviess County $250 each, and the bank $500, and the State of Missouri $500, making a total of $3,000. 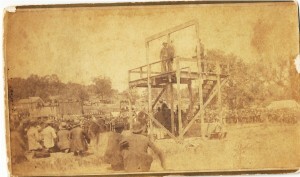 The Winston train robbery, for which Frank James was tried in Gallatin in 1883, occurred at Winston in this county on the night of July 15, 1881. 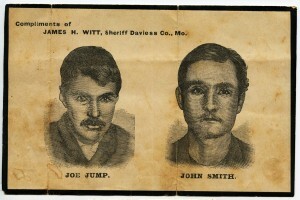 By this time, the reward for the capture of the James brothers totalled $50,000. Clarence Height was caught and he plead guilty to the Winston train robbery and was sentenced to a long term in the state prison. He said he was on the engine and looked after the engineer and fireman. He was pardoned and died shortly afterwards from tuberculosis. “In 1866 the Wynne family bought and moved into a home located where the Democrat office now stands and in the front yard of which he heard the shot that killed Capt. Sheets in the robbery of the Sheets bank in 1869. At that time the population of the town was about 300, and there was not a graded street nor sidewalk in the town except in front of the few business houses. There were no railroads here then, and all merchandise was brought in by a stage line running from Hamilton to Gallatin.